On November 4 – December 3, the Market Research Centre performed a representative national survey commissioned by the Homeland Union – Lithuanian Christian Democrat party. The survey asked the people’s opinions on the current cabinet’s work. The survey showed that the cabinet’s work is viewed well or somewhat well in only one area. 1021 respondents were interviewed for the survey. The questions inquired about the respondents' views of the cabinets work in specific areas, also a number of questions related to the Lithuanian political system were posed. Questions asked, whether the respondents agree with four statements they were presented. 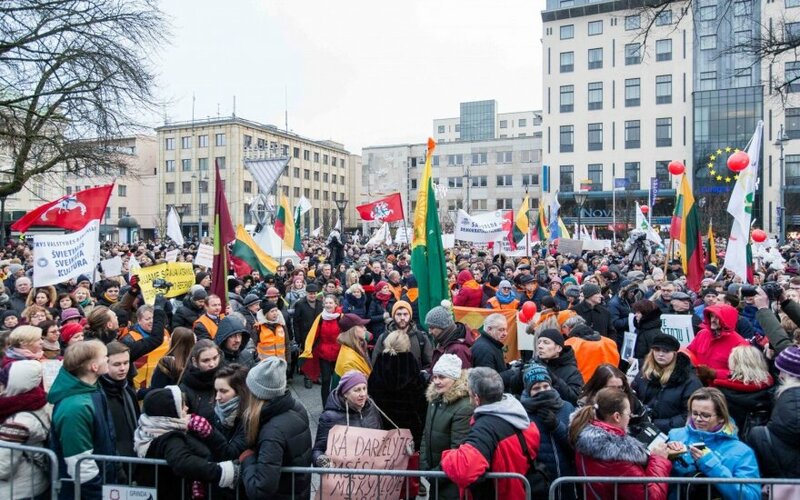 Most survey takers believe that the political party, which wins the elections, must hear out to the opposition's opinion, that Lithuania needs a strong political party, that the current government's actions pose a threat to democracy in Lithuania and also most respondents did not believe that all parties should be banned in Lithuania and strong presidential rule should be established. In terms of specific areas of the cabinet's work, the respondents were positive or somewhat positive only regarding one area – the country's foreign policy. 28.5% of respondents view the cabinet's foreign policy positively or somewhat positively, 27.3% were neutral, 23% believe that the cabinet works poorly in this area, while 12.9% did not have an opinion. The respondents were most negative about the cabinet's work in reducing prices. A whole 61.2% of respondents believe that in this regard, the cabinet worked poorly or more so poorly than well. Only 12.7% of respondents viewed the cabinet's work positively or more so positively than negatively. 22.2% of respondents were neutral, while 3.2% did not know how to answer. Respondents rated the cabinet's work poorly or somewhat poorly in ten areas – raising wages (43.5%), strengthening energy independence (31.3%), ensuring justice (41.6%), fighting corruption (42.6%), creating new jobs (42.8%), reducing social segregation (52.2%), improving healthcare services (54.1%), improving the education situation (53.8%) and reducing prices (61.2%). Vilnius University Communications Department Digital Media Lab head Andrius Šuminas told Delfi that some of the survey results shocked him. "I was shocked about the statement about banning parties, the numbers at the "agree" or "somewhat agree" sections were shocking. Factually, we have almost 35% of people, who agree with such a statement. This number is shocking, not everything is fine in our society. The number is far too large. It could present various thoughts and is certainly not a positive matter for our young democracy," the communications expert said. On the other hand, according to him, most answered positively when asked if Lithuania needs strong political parties. And here lies a contradiction because some people agreed with both statements. 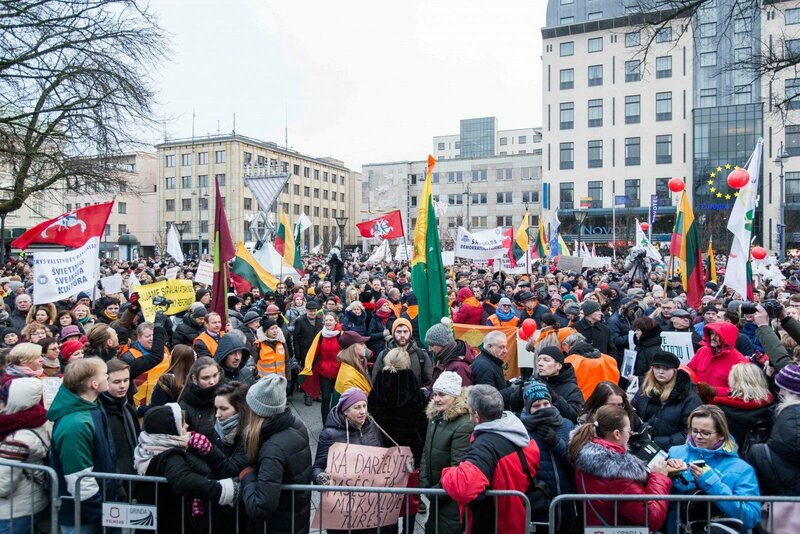 A. Šuminas is convinced that if the survey was to be held right now, the question on whether the cabinet's actions pose a threat to democracy in Lithuania, more people would have answered affirmatively. "In terms of protests and such peculiar statements by the prime minister himself, accusations against the opposition and taking notes to the VSD, the arrogant tone of speaking, which only increases the protesters' outrage, I believe that these numbers would certainly be larger if the survey was held today," he is convinced. According to A. Šuminas, the worst ratings are in the areas, which are also closest to the people and most sensitive. "It is natural that people think more about it. Healthcare, education, social issues – these are all sensitive areas, which people face very directly. Meanwhile, foreign policy and energy, these are more distant matters that people do not experience in their daily lives," the communications expert says. He believes that the cabinet's foreign policy could be perceived more positively because currently, questions about it are not at the centre of attention, no scandals have appeared in this regard, thus the impression arises that politicians are working well. As for the poorest figure – 61.2% negative ratings regarding the cabinet's combatting of prices, A. Šuminas stated that he believes that the cabinet has entered a fight it cannot win. "How will the cabinet reduce the prices? We are in a free market, how much can you regulate this? In essence, such rhetoric, stemming from the cabinet itself, from the prime minister, it becomes a double edged sword, which ends up cutting the cabinet itself," A. Šuminas said. He believes that the currently ongoing teachers' strike could adjust the ratings of the education area toward the negative as well. Meanwhile, Klaipėda University political scientist Saulius Šiliauskas believes that the survey shows that the public is inclined to view the cabinet's work critically. "It is clear that critical views of the cabinet's work is a general trend, with the only exception being foreign policy, with more positive ratings than negative. On the other hand, we see here that around 13% do not know or did not answer. What could this mean? That foreign policy problems are not relevant to voters right now. Less relevant than the other areas," he believes. According to S. Šiliauskas, the survey clearly has several blocks, which send positive news for the cabinet and others – less so. "Among the more positive, I see that people view the cabinet's work a little better in terms of raising wages, creating new jobs and reducing unemployment. Based on the positive evaluations, efforts to raise wages take second place. However, a question arises here, whether it was the private or the public sector that was rated and whether the respondents make the distinction," the political scientist said. According to S. Šiliauskas, it is clear that there are four problematic areas, which the government has directed its attention to, however the public is not content with its work in them, these being: social segregation, healthcare, education and prices. "What needs to be noted is that the reduction of social segregation has been ongoing a long time, it is not a momentary decision, however this cabinet and this majority emphasised this matter greatly, however the people currently do not see any positive action from the cabinet in this regard. Hence, the cabinet is exactly declaring that this budget is oriented toward reducing segregation, that everyone will feel improvements," the political scientist believes. He would have also included the matter of emigration into the survey, however he admits that the cabinet itself seems to have drawn back and appears to have come to terms with this problem. According to him, there are also problems in both healthcare and education. The surveys were performed at a time when the teachers' protest had not yet gained momentum. S. Šiliauskas is convinced that the cabinet should be focusing on namely these areas even more. "These ratings also denote that the overall situation is such that the credit the cabinet has received is greatly diminished and critical moods are dominant. Some could say that only two years have passed and that this cabinet is working, but others may say that two years have already passed," the political scientist says. S. Šiliauskas is convinced that if the survey was to be held right now, the numbers would be more unfavourable to the cabinet. I would say that if a politician says something in the heat of the moment, someone should afterward advise them to not continue it. The cabinet is stepping on the same rake as the Conservatives did and as the Butkevičius cabinet did, trying to associate teachers' strikes with the Kremlin. It is an attempt to securitise domestic policy problems. And even more, linking it with a potential failure to approve the budget, that supposedly elections may not be held if the budget isn't approved, which is a scandal in and of itself," the political scientist says. In regard to some people supporting both stronger parties and parties being abolished, S. Šiliauskas assumes that people think this way because the current parties are simply too weak. "There is cause for concern for the cabinet, there is cause for concern for political parties regarding such statements by the public," the political scientist summarised.